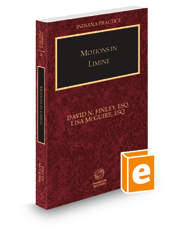 Indiana Motions in Limine covers critical evidence motions that, if granted, can end a case early. The text covers issues such as excluding expert opinions, scientific tests, and improper discovery. It contains 10 comprehensive chapters of relevant cases, statutes, and sample motions.